Well, I’m back, and I guess I owe an explanation for my absence the last couple of months. 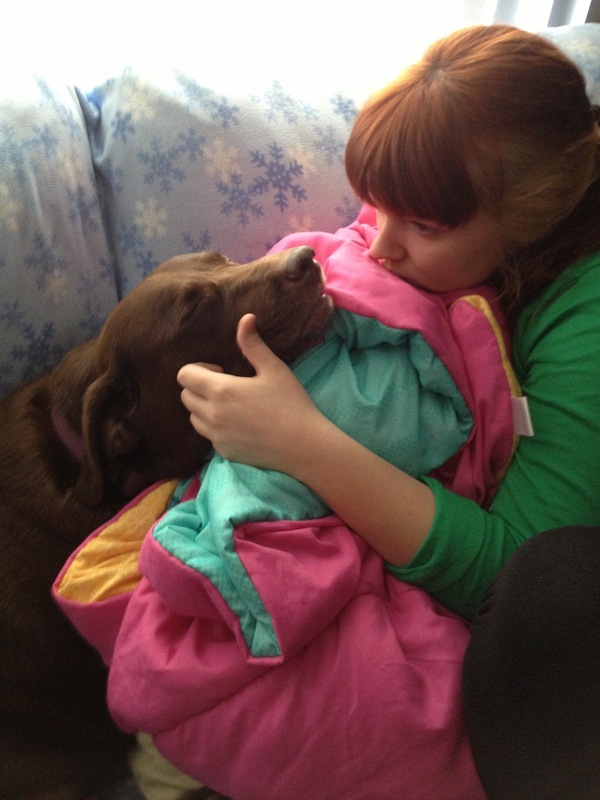 The photo above is of my daughter, Johnna, with my nine-year old chocolate lab, Bella. It was taken on the last day of Bella’s life. Born on February 14, 2004, she died on June 28, 2013. She had a really aggressive mammary cancer (breast cancer). From the time I first noticed it until the time she died was perhaps a month. It grew like wildfire and spread to her lungs. The hardest part was watching her suffer, not even really knowing the depth of it. Finally, though, she became unable to breathe. She negotiated the length of the living room and my daughter and I helped her up onto the couch, and she was panicking because she couldn’t catch her breath. She pointed her nose up towards the window, which was closed because it was an oppressively hot day. Johnna and I took turns fanning in front of her face so she would feel the air, because that seemed to help her. We piled up blankets for her to lean against, because she was exhausted but couldn’t lie down, whether because it was painful or because it made it more difficult to breathe. I’d spoken previously about Bella to a dear and wonderful person whose name and praises I’d like to shout to the sky. I am not going to do that because I have to respect her privacy and I don’t want her to be receiving requests from others to do this. She is licensed to perform euthanasia, and she had said that when the time came she would come to our house to put Bella to sleep. I am so grateful for that. On that day when Bella was no longer able to breathe, I told her it was time. All of Bella’s family gathered in my living room that evening. Bella was sitting upright. Johnna was on one side of her and I was on the other, and we each held her. I’d been told by several people how fast euthanasia is, but I don’t think anything could have prepared me for it. I will forever remember the feeling of Bella literally collapsing in my arms. Just that fast, her suffering was ended. But just that fast, she was gone. Gone from our lives, but gone from her own life as well. But I don’t know, and that’s the sad thing. To make the decision to end the life of a living being is a terrible, terrible thing. Anybody who knows me that I really really hate ever killing anything. I try to catch and release whenever possible. Mind you, I’m a germophobe also, so the presence of some of these things in my house is really disturbing. But when I close my window on a day that is growing hot and I see a fly caught in between the window and the screen, I always shoo it out so it won’t fry in the heat of the sun, even though I know that it will crawl on my food later in the day if it gets a chance. I catch spiders and take them outside. If I see an ant on the counter, I actually put it in the garbage. If a line of ants wants to come to my garbage can, I don’t care. Only if they start parading on my counters do I take lethal action. Most people would say I anthropomorphize, but I attribute all sorts of feelings to these little creatures. I envision their expectation of life, and I cannot take it upon myself to end it. I couldn’t watch Bella suffer anymore. Being unable to breathe is a terrible thing. But ending life is a terrible, terrible thing. I have always said that I am not afraid of dying itself. I don’t believe in heaven and hell. I figure either I will go on or I will not, and if I don’t then I won’t care. It’s really for the people left behind that I fear my own death, because I don’t want them to suffer. But to have a hand in taking life from another, especially another that I love so much, breaks my own heart regardless of the good reasons for doing it. And of course, every experience of loss contains within it every other experience of loss. I don’t think it is possible to experience a new grief without every grief you have ever felt rising up to join in. We suppress grief eventually, so that we can go on with life, but it isn’t something that really heals. You know, for Michaela I know this is true as well, if she is alive. However long it has been, however much has changed, however deeply entrenched she may have become in the new life she has been subject to, I know that underneath it all lies a vein of loss. Only this loss can be healed. With the loss of Bella, there is another little heart that is broken. 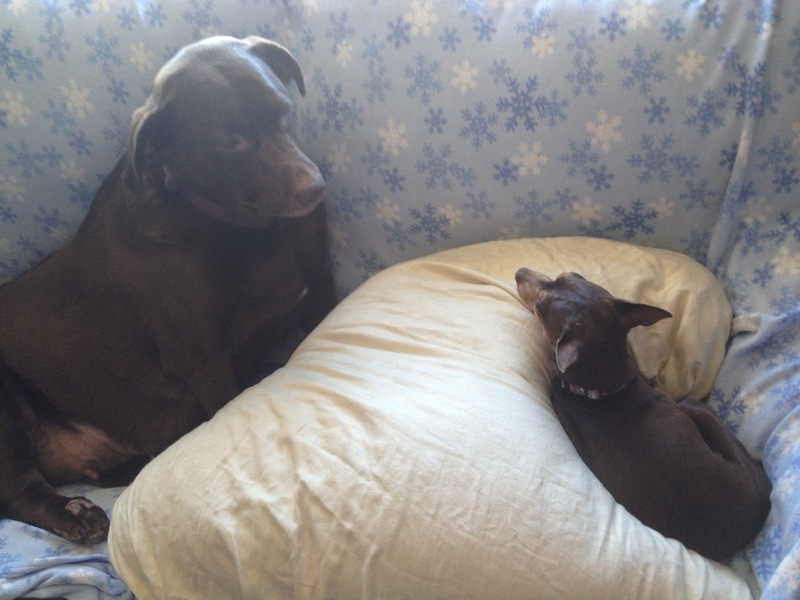 Bella was a 90-pound Lab, and I have an 8-pound Miniature Pinscher who loved her. I had him in his crate during the actual euthanasia, but afterwards I let him out. He came and sniffed Bella’s mouth, perhaps wondering why she wasn’t breathing. She had a blanket around her, and he crawled inside the blanket. Since then, he has been okay when someone is with him, but when he is alone, he howls with grief. Because of the difference in size, it didn’t seem that Spike and Bella spent a lot of time together, but I am recalling now that whenever I left for work, if I came back in the house to get something, Bella would be on the couch, where Spike’s blanket is (he has to have something to burrow in). It had never before occurred to me that what she was doing was keeping him company. Perhaps he has always been sad, or scared, when left alone, and Bella knew that. At any rate, when Bella was here, he didn’t howl like he does now. Often there is someone else here, my daughter asleep in her room, my husband downstairs in the garage. (This is how I know about the howling.) It had been my plan to keep Spike as an only dog, but now I think I will have to get a friend for him. Bella and Spike, on Bella’s last day. Who knows what they were saying to each other in this moment. Well, one day I hope to be able to write a happy blog. In the meantime, thank you for bearing with me and sharing my heart. Bella, I hope that you are running free in a meadow somewhere, with that beautiful smile on your face, your tail high in the air, no fear of anything anywhere, only happiness, and the knowledge that were and always will be loved. And Michaela, I love you forever. I haven't seen the story, but I have talked to Kim, Amber's mom. Thanks. I just wanted to say Your courage and strength are simply amazing. I am from N.S. Canada and saw this story and had to tell you, you are one of the strongest people to have gone through what you've gone through and be where you are. My prayers are with you and in the hope you get Michaela back. Yes, just have to calm down and rethink. I will address it later. Thanks. I had another dream. In it a Sketch Artist slowly drew a pic reflecting SUSPECT AGE PROGRESSION. The sketch was released to the public…some time went by….then the composite sketch had a bold lettered word stamped across it “RESOLVED”! A composite sketch is done with an eyewitness right after a crime. We have an excellent composite sketch and it would be impossible to get a new one because too much time has passed and memories blurred.. Nor can they do age progressions of composites. I don't think age progressions of missing kids are accurate, and for those they use photos of family members to try to see what the child would look like when older. Can't do that with a composite. We also don't have the resources to properly investigate the solid leads we have, and definitely can't handle a slough of calls from people about suspects for no reason other than that they look like an age progression which is probably not accurate, and for which we already have dozens of lookalikes. If your dream is going to come true, it will have to be in the realm of th symbolic. It's been 2 months since you've posted anything new. Hope you're ok.
One day technology will advance to a point that these animals who take children wont be able to hide. I just read in the NY Daily news of a cold case being solved from 1995 using new DNA technology where a vacuum extracted DNA from a rock that was used to kill a 17 year old girl. I still pray Michaela is found and saved from her captor. One day the missing puzzle piece will be located. I don't know for sure Tanja, and English was not his first language either. I assumed he meant she had changed too much to remember herself, because as you said,the right word if we wouldn't know her would be recognize. It was an Indian burial ground. The bones were very old. I read today the authorities are reopening the Amber Swartz case. I hope you'll be able to post an update on your family and Michaela again soon. Garrido is said to be 6’4” in height ! http://www.bing.com/images/search?q=PHILLIP+GARRIDO&qpvt=PHILLIP+GARRIDO&FORM=IGRE#view=detail&id=3BEA2B5E0DCA4E4699BC14CBC9366E03A89872CD&selectedIndex=147YET in this news article Garrido’s brother said “It was at the federal prison in Leavenworth, Kan., that Phillip Garrido met his wife, the visiting niece of another prisoner.The couple communicated through letters and then married in a ceremony held behind prison walls, Ron Garrido said.”http://www.sfgate.com/bayarea/article/Kidnap-suspect-had-criminal-past-brother-says-3288260.php#photo-2363217In 1988 Garrido was released from serving 11 years in prison. Could other close prison friendships have been forged with Garrido, in the segregated offenders unit, that spilled over to doing outside crimes together ? You keep hanging onto Garrido because you only hear what the media carries. We have far better leads than this. Well, I'm not sure I'd say that looked like a park like setting. Those cement pipes are actually used as play equipment in playgrounds. But the garridos have been investigated fully and extensively. I'll keep an eye out foe cement pipes in other locations I know are under suspicion though. Thanks. In reference to the Garridos passing polygraph tests or those likes of murderers, rapists, and kidnappers passing polygraph tests, sociopaths can pass polygraph tests – with not help. Not from a book, or advice, or anything. They simply do not feel. And the large majority of people who commit crimes like these, are sociopaths. How do they do this? Sociopaths do not feel, they do not have empathy, and they can lie without blinking an eye. When those are not sociopaths lie, there are actual physical changes that occur in our body. Our heart rate can speed up, palms sweat, eyes can get twitchy – and a polygraph test picks up on this – no matter how hard you try to control it. We know we're lying. The central nervous system provides the polygraph tests with the responses necessary to determine lies from the truth. Sociopaths, however, do not have these responses because they do not have the ability to care that they are lying. Therefore, they don't show the same physical alerts that a polygraph test would pick up on. The Garridos are quite obviously sociopaths. Otherwise, they would not have been able to keep girls hidden away for years, and kill others. Lastly, all criminals are sociopaths, but not all sociopaths are criminals. Your argument fails logically. If all criminals are sociopaths and lie detector tests don't work on sociopaths they would have given them up long ago. I do not, by the way, believe Nancy was a sociopath. I think she was a victim of Garrido who was brainwashed by him. But let's put it this way, extensive interviews were conducted, in which by the way there were many tears shed as they read my blogs to them. In addition, our police department literally tore down and demolished the little prison area at the garridos and thoroughly searched the house. You can safely let this one rest and just pray for the resources so that investigators can investigate the other leads as fully. Sharon, have you read “Tear Soup”? It's a grief book that is laid out like a children's story, but it is really for adults. The imagery is fantastic and I felt really validated after reading it. http://www.amazon.com/Tear-Soup-Recipe-Healing-After/dp/0961519762I think that when you have such a significant loss in your life, other losses can bring you back to that place. I am so sorry for the loss of your dog. When our dog died, our other dog hid for days in a corner of the garage and was clearly depressed. It is amazing that dogs can feel and express grief, too. I think you are right Meredith. To the person who asked me not to publish the comment, I could not access the page. I watched this informative video “How It's Made Concrete pipes” http://www.youtube.com/watch?v=E6jlTxhL8bg & wondered if some of the park/pipe” visual impression” might indicate: THE JOB/ Line of work the terrible kidnapper worked in that might have even left the visible mud/cement residual on his car?If I remember correctly Ilene M went missing passing through a park—Amber S lived near a park-and a park was not too far from your house (?). Did his work play a key role in viewing victims ahead of time without being noticed? Such as a job with: Parks and Rec—School District— a utility district– EBMUD storm and sewer water processing systems –National Park Service- or Independent Contractor companies- drinking water/irrigation/ pipe repair –Deliverer-Installer or repairer of metal, hard plastic, or cement “play ground equipment.” etc? That's because the Johnny Gosch people use our composite on their website.